However, before tackling those subjects, and given the serious nature of many of the films I’ve watched recently, I wanted to spend the month of March with more light-hearted fare. Enter the screwball comedy, a genre that emerged during the Great Depression and dominated the 1930s. With the coming of the war, this dominance would eventually give way to film noir, but, man, was it fun while it lasted. 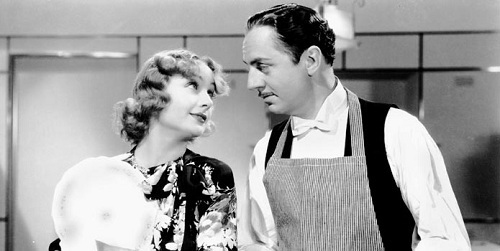 Carole Lombard and William Powell do the dishes in My Man Godfrey. Some characteristics of screwball comedies are fast-paced and witty dialogue, strong female characters, and absurd situations. Often couples are mismatched, especially when it comes to class and social standing, and mistaken identities and secrets abound. In that way, they remind me very much of my beloved Regencies. 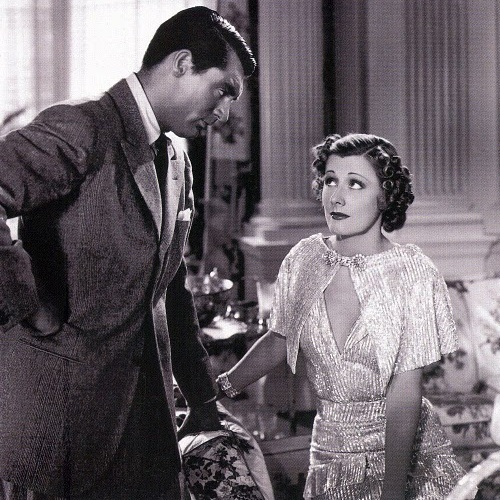 “I wouldn’t go on living with you if you were dipped in platinum.” Fighting words from Irene Dunne to Cary Grant in The Awful Truth. Although I love film noir and westerns, if forced to choose my top ten movies of all time, inevitably there would be a few screwballs in any list I might come up with. * [If you remember my Hitchcock series, some of my favorite films were ones with screwball elements, namely The 39 Steps (1935) and The Lady Vanishes (1938).] Depending on the day, such a list might include The Awful Truth (1937), His Girl Friday (1940), It Happened One Night (1934), My Man Godfrey (1936), or The Palm Beach Story (1942). Regardless, The Thin Man (1934), a screwball twist on gangster-mystery films with copious amounts of alcohol, will always be near the top. The important thing is the rhythm. Always have rhythm in your shaking. Now a Manhattan you shake to foxtrot time, a Bronx to two-step time, but a dry martini you always shake to waltz time. So, over the next few weeks, look for posts on the early 1930s and the work of Ernst Lubitsch, forgotten films and classics of the genre, and the rise of Preston Sturges. If you don’t know these films, I hope I can inspire you to check a few out. If you do, I look forward to hearing about your own favorites! * I must say, looking at various lists to come up with what I might watch for these genres, I came across the AFI Top 100 (best American films) lists from 1998 and 2007. Reviewing the two versions, I learned that 23 films had changed from one list to the next. While I get some of the changes, in what world does it make sense to lose the presence of Stagecoach, The Third Man, The Manchurian Candidate, and Fargo to get the likes of A Night at the Opera, 12 Angry Men, The Sixth Sense, and The Lord of the Rings: The Fellowship of the Ring (and how is that last one even an American film)? Ahhh, one of my favorite genres. It’ll be interesting comparing notes with you.